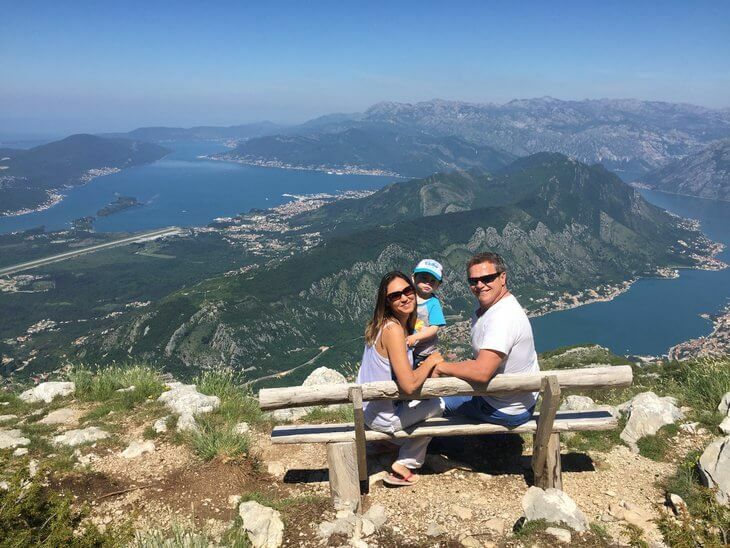 Stunning scenery, family-friendly adventure, history and beaches combine to make the Mountain High to Cavern Deep itinerary a day to remember in Montenegro! 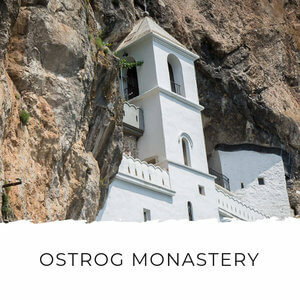 This day trip itinerary takes you high up Mt Lovćen and into Lovćen National Park, where you’ll get stunning views of not only Montenegro, but neighbouring Albania and Croatia. 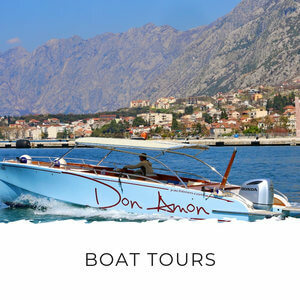 It also takes you to Montenegro’s old royal capital, the seat of Montenegro’s royalty and home to the national museum. 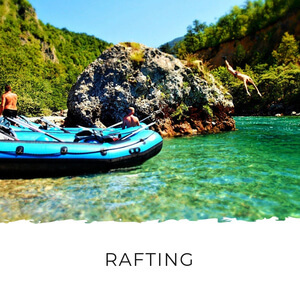 Then you’re plunged into the depths of Lipa Cave, a fun family-friendly activity that’s great for all ages, before finishing up your day in beautiful Budva. 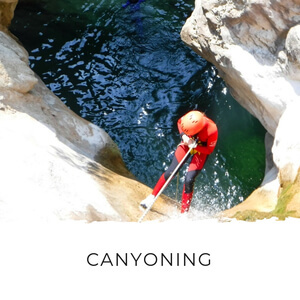 You cover a lot on this itinerary, but at less than 100km, you won’t spend all day in the car – there are plenty of chances to stretch your legs and explore. Total Drive Time: 2 hours, 22 minutes. 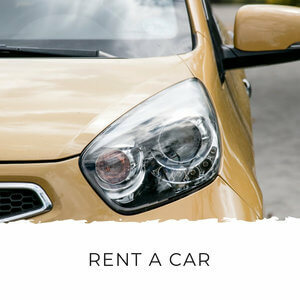 The trip is flexible and designed to offer you plenty of places to stop and optional attractions. 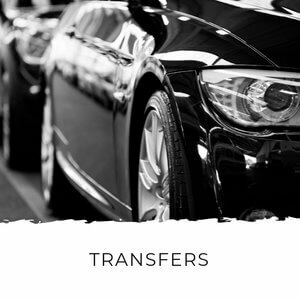 You can shorten, lengthen or leave out altogether your stays at any of the places mentioned and still do the round trip. It’s completely customizable to your interests. 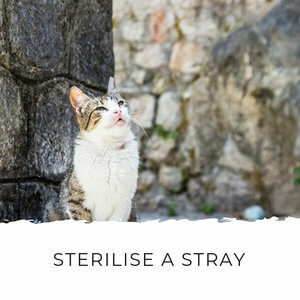 If you’re travelling with young kids, you might want to stay longer at Ivanova Korita, but leave out Petar Petrović Nejgoš’ mausoleum and the museums of Cetinje. Likewise, if you’re interested in history, you can leave longer in Cetinje and skip Ivanova Korita. 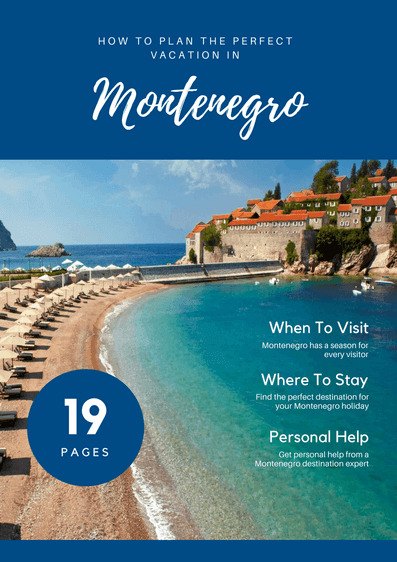 Either way, this is a fantastic day trip to some of the most beautiful and interesting sites in Montenegro. 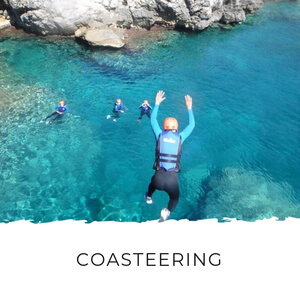 Get your camera ready and don’t forget there’s a free printable of the itinerary at the bottom of the page. 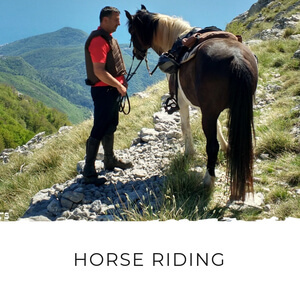 Also, this is a self-drive tour so you’ll need a rental car (if you’re not in Montenegro with your own car). 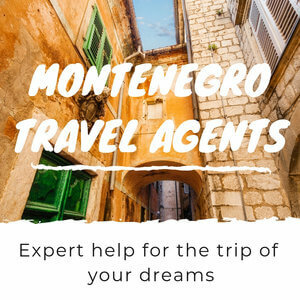 I highly recommend reading my rental car page for advice about renting a car and driving in Montenegro. Distance: 35km, 1 hour drive. 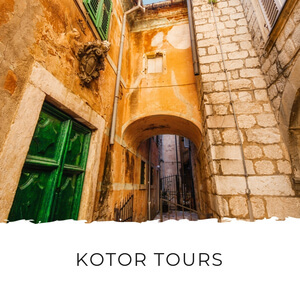 You can start this tour with a visit to Kotor old town, but I’d recommend dedicating more time to seeing Kotor and visiting it on a separate day. 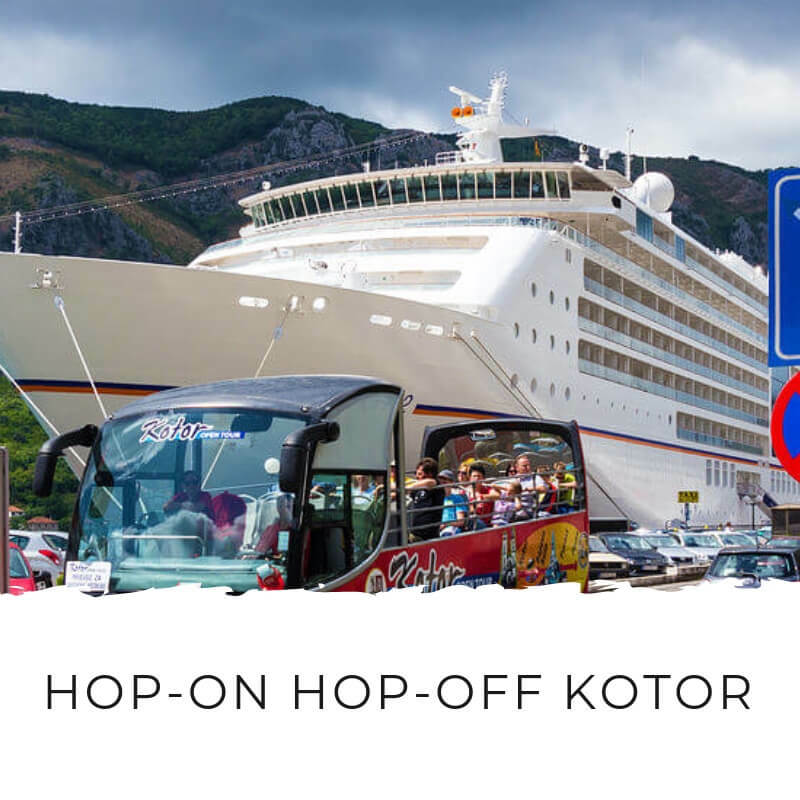 Starting out from Kotor, drive up the Serpentine Road towards Lovćen National Park. There are 25 hairpin turns on this road and the view gets better with each one. There are plenty of places to stop to admire the view, but the one not to miss is just inside Lovćen National Park. From here, continue into the park. This is one of my favourite stretches of road in Montenegro. It takes you around gently sloping hillsides, past ruined stone houses and through lush countryside. 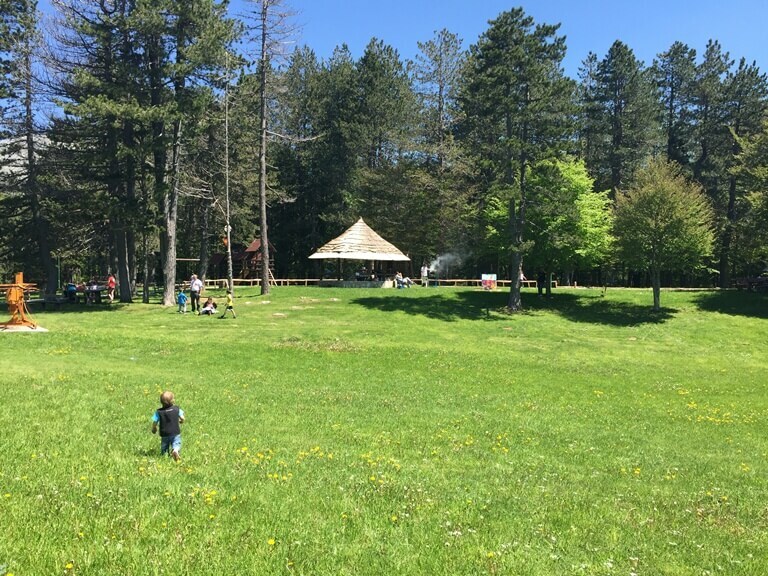 You can get out and stretch your legs at Ivanova Korita, a lovely open field and wooded area with a playground and plenty of space to kick a ball or spread out a picnic blanket. I recommend leaving early and bringing a picnic breakfast to enjoy here in the national park. Ivanov Konak is a great place to get breakfast and coffee. From Ivanova Korita it’s a 7km drive to the mausoleum of Petar Petrović Njegoš, Montenegro’s favourite ruler, on Mt Lovćen. There’s a bit of a hike up to the mausoleum (461 steps to be precise), but the views are so worth it. 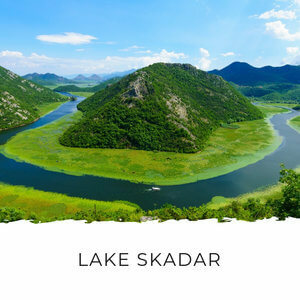 You’ll get 360 degree views of Montenegro, the Adriatic Sea, Croatia and Albania on a clear day. You’ll also get a new profile picture for Facebook! To get this pic climb up on the parapet of the circular viewing area behind the mausoleum and jump up as high as you can. Make sure you land back on the wall and don’t jump backwards or that will be the last photo you ever take! For the best effect, get the person taking the photo to crouch down and get you from below. 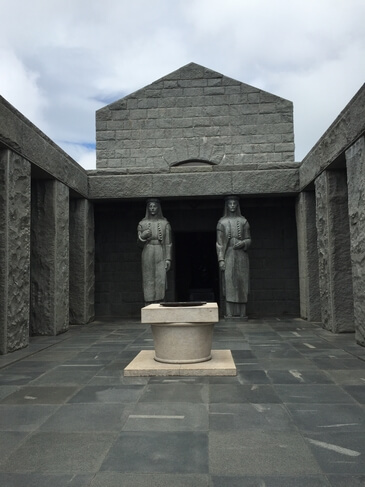 Leave about an hour to walk up to the mausoleum and look around. The entrance fee is €3 per person. Distance: 20km, 35 minute drive. From Lovćen, you head down towards Cetinje town. There’s a main carpark beside Njegošev Park which costs €5 (it’s the same whether you stay an hour or all day), but if you drive around you’ll also find free parking within walking distance from the centre. Cetinje is the old royal capital of Montenegro and is the home of the national museums. 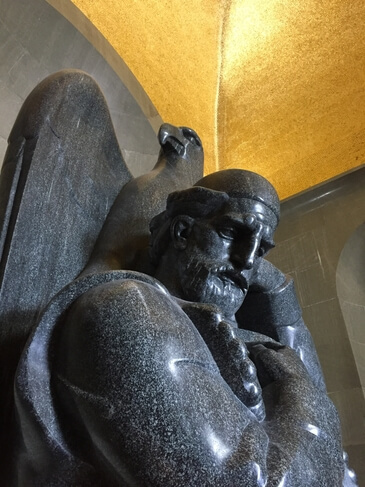 If you’ve only got a short time King Nikola palace is the must-see attraction. 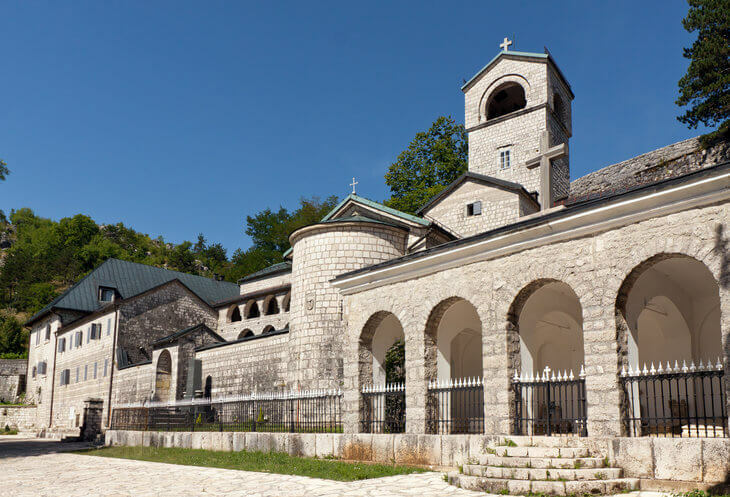 You can spend anywhere from an hour to several hours in Cetinje if you visit the museums and monastery. The great thing about this town is it’s teeny tiny and you can walk everywhere. 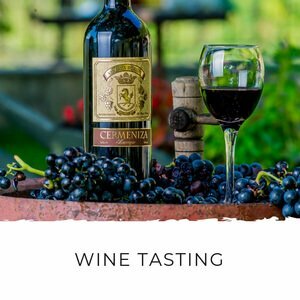 Cetinje isn’t known for its great restaurants, so if you’re getting hungry I suggest grabbing lunch at Belveder Restaurant either before or after visiting your next stop, Lipa Cave. Distance: 5km, 10 minute drive. 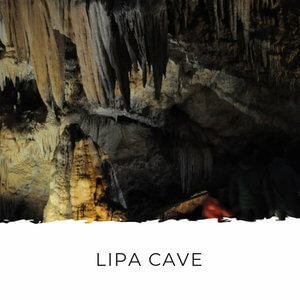 From Cetinje go to Lipa Cave. 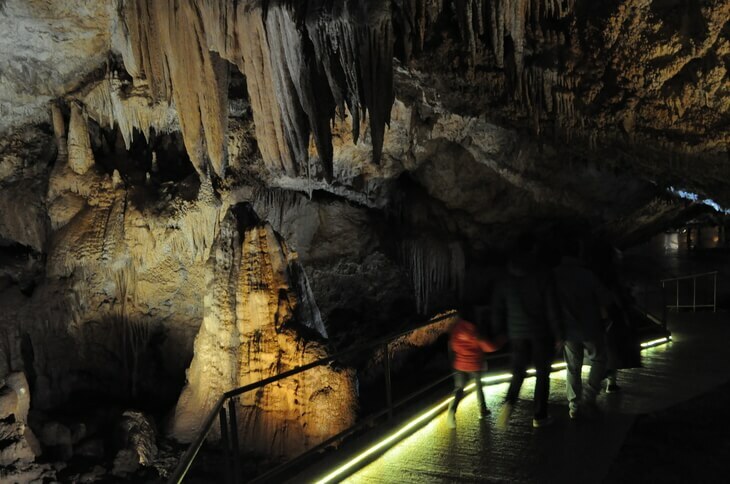 The cave is a natural karst cave, where you can take guided tours. This is a must if you’ve got kids! There’s a little train that takes you to the cave and then you have a guided tour through it. It’s very cold in the cave, so you’ll need warm clothes no matter what time of year you visit. 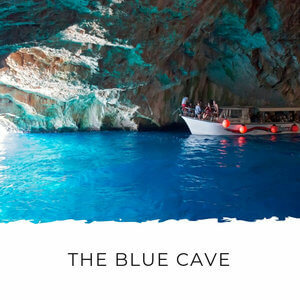 You need 1 – 1 ½ hours for the cave tour, which go every hour and half so check the schedule on my Lipa Cave page to make sure you arrive in good time for a departure. There’s a café onsite and a shop where you can buy small souvenirs and local specialties like honey. Distance: 33km, 37 minute drive. 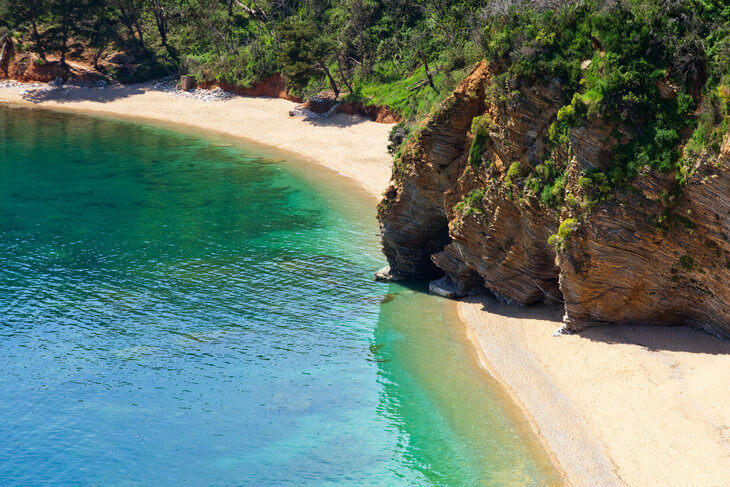 Take your swimmers and freshen up with a dip on one of the Riviera’s beaches like Mogren or Jaz. Walk through the old town. 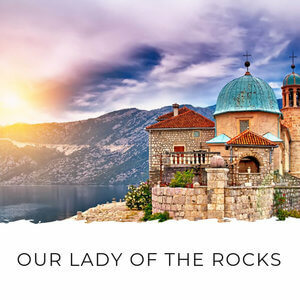 Drive 15 minutes north to Sveti Stefan for a swim, walk through Milocer Forest Park or enjoy a Mediterranean dinner overlooking the island at Olive Restaurant. This is the end of the day trip. 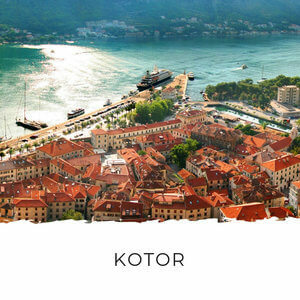 You can also do this itinerary in reverse and finish in Kotor.